The needs of every Mustard client are different. Mustard IT does not operate a 'one size fits all' policy but instead studies a number of factors before recommending a final solution. These may include capacity, performance, scalability, availability, data protection and budget. Servers and storage devices are the most critical components on your business network, since they store the data that enables your organisation to function. As such, Mustard engineers will perform a thorough review of your backup and disaster recovery plans any time we are asked to specify this kind of hardware. Network servers sit at the heart of any organisation, allowing users to share data, internet access and peripherals like scanners and printers. Mustard engineers will analyse the business applications you are running and the corresponding storage requirements, before recommending best-of-breed hardware to fulfil your needs. 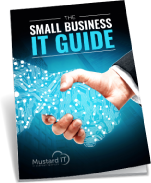 Small businesses may manage with a single server or a hybrid solution with email being managed in the cloud. Larger organisations may require dedicated file servers, email servers and application servers. For some businesses, especially those who are subject to regulatory compliance legislation, the integrity, availability and protection of data is central to their productivity and long-term success. For these businesses, NAS and SAN solutions may also be recommended. When hardware is as critical as a file server or storage device, Mustard will also generally recommend redundancy options, from disk mirroring and RAID solutions right through to live server replication. Our expert engineers will study your business process and analyse the corresponding storage requirements, before recommending a server solution to fulfil your needs. We’ll future-proof your investment with some room to grow and propose redundant options to protect your key data.